The Ervoli Nomads carry little; they have a hard enough time wresting survival from their desert lands without burdening themselves with extra weight. Their mostly-ceremonial “coinage” consists of Feather Bands – intricate pieces of feather-and-bead art which record legends, great events, and accounts of the lives of wise men, heroes, and exceptional fools. Feather Bands range from the garish efforts of beginners – who often resort to the use of beads of precious and semiprecious stone, and brightly-colored feathers from magical beasts, to make up for their lack of skill – to the creations of great masters, who may need but a scattering of subtly-colored beads and pigments upon a simple plume to convey an epic tale. Feather bands have a wide variety of values, although the system can be difficult for outsiders to figure out; bright, beautiful, and spectacular pieces may be of little worth – at least among the Ervoli. Once you get far enough beyond their borders, their value may increase sharply if you can find someone with more money than taste. The minimum value is, however, a couple of silver pieces. Anything which cannot meet that standard tends to be discarded by the artist. The maximum value is usually around twenty gold pieces. Masters of the art sometimes create Feathers of Truth, mystically weaving some lesson or adventure from their lives into the structure of the piece. Such works can be imbued with 5-50 XP, and the images they call to mind seem to flicker with life. The possessor of a Feather of Truth may invoke it in a brief ritual before sleeping or meditating, in which case its creator – or his or her spirit – may opt to expend 1 XP from the Feathers store to visit the invoker in a vision (wherein he or she will usually offer more or less cryptic advice). The owner may also choose to drain the XP from a Feather of Truth via another brief ritual, fully experiencing the lesson or adventure woven into the Feather and adding it’s XP to his or her own. Feathers of Truth are normally worth 25 GP + 5 GP per XP they contain, and – as works of art – continue to be worth 25 GP after their XP store is entirely drained. Among the Ervoli, it is said that no man or woman is truly dead while a child of their blood, or a feather of their heart, survives. While rumors that the Ervoli can use a Feather of Truth to invoke an ancestral spirit to aid them have never been confirmed, there do exist a few legendary Feathers of the Divine – fabulously valuable talismans that allow the bearer to use the XP stored within them while he or she bears the feather, albeit only to boost his or her own powers, not for purposes such as making magical items. 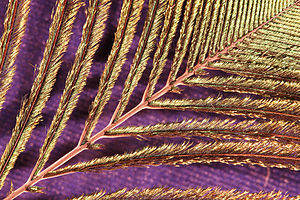 Such feathers typically contain 5000 to 10,000 XP, are typically valued at ten times that in gold pieces, and can be placed in any item slot – although, perhaps fortunately, no one can use more than three such feathers. That’s not enough XP to do all that much for a high level character, but it’s a fabulous boost for a novice – making Feathers of the Divine almost uniquely likely to be passed on to youthful friends and relatives. On the day of dead, when tombs and graves open as the mouths of the underworld, and the spirits of the long-deceased walk the lands of the living, those daring enough to open their doors to such wandering shades – and who welcome their cold and spectral guests with the warmth that only the living can muster – may be paid for their hospitality with the imperishably tarnished black coins of the underworld, where even gold is touched by decay. A single Tenebrous Obal will bring a susceptible dreamer into touch with the dead who are linked with him or her – although whether that is a delight or a nightmare depends on the nature of those links. Such a dreamer may also choose an easy death when weakened, wounded, or in pain, passing easily and painlessly from life to death while the coin quietly vanishes. Thirteen or more Tenebrous Obals will allow the user to perceive the shadows of death and the dead; he or she can see, hear, and affect the spirits of the dead, detect the approach of death in the injured and ill, sense the gates of the underworld, and even see (and, if truly courageous, attempt game with or battle on more or less even terms) the dread specter of death when it comes to claim a victim. Sadly, the “stakes” in such a battle are always the same; double or nothing…Equally unfortunately, the price of this ability is that one is drawn to the underworld more swiftly than normal; not only can the spirits of the dead perceive and affect the user as he or she can perceive and affect them, but he or she ages more swiftly than usual – aging eight days for every seven that pass. A pouch full of Tenebrous Obals gives the underworld a greater claim on the bearer; whenever he or she is attempting to resist a poison or disease, he or she suffers a -1 penalty. Whenever he or she takes damage from any source, he or she will take one additional point of damage – however, the coinage that was purchased by sharing the life and warmth of the living with the dead may be expended to get the dead to share some of their no longer needed strength with the living. As a move-equivalent action, the bearer may expend those funds to “purchase” any curative spell effect of up to level four – neutralize poison, cure blindness, restoration, cure light wounds, or whatever – at the standard rate for purchasing spellcasting services. Such a purchased spell may be assigned to anyone who is in the area and willing. Unlike normal coinage, Tenebrous Obals can be spent at face value anywhere – including in places where normal coinage would be of no use whatsoever. Living warmth, compassion, and remembrance are desired even in the depths of the abyss and may, perhaps, suffice to buy passage from creatures as terrible as the guardians of the underworld themselves. For good or ill, however, Tenebrous Obals are hard to come by. Outside of the underworld itself, there are few hordes of dark coins.